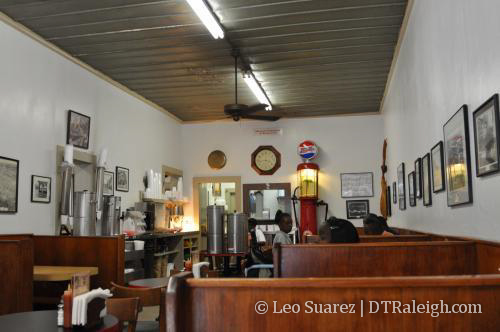 It has been awhile since I’ve had any of Clyde Cooper’s delicious barbecue. Since I’m never in downtown during the workday, Saturday is my only time to visit so this past weekend I made a point to go. Cooper’s has been in business since 1938 and the restaurant on Davie St. is an old diner-style barbecue place. 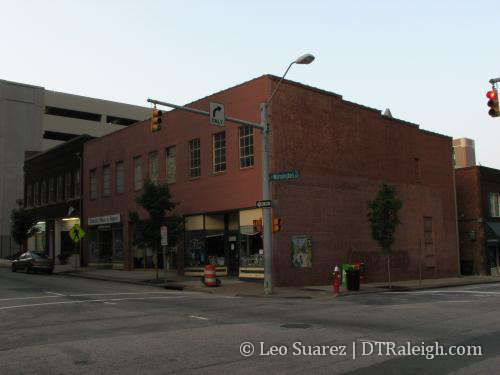 They have been in downtown Raleigh for a long time and it is tough to compare them to the newer, and more talked about, barbecue place, The Pit. It is a great restaurant and I enjoy visiting but in my opinion, Cooper’s has defined their style and really serves downtown Raleigh better with a neighborhood, friendly feel. You cannot beat their $3 barbecue sandwich and for the money, the trays and dinners are one of the best deals in downtown. In the coming years, it will be interesting to follow what will really happen on this corner of Davie and Wilmington St. when the The Edison starts to come alive. The plan is to remove the older buildings on this block for a 39 story tower. Nothing is certain yet so only time will tell. Enjoy Clyde Cooper’s and the other businesses on this block. Clyde’s certainly can make a claim to some of the best barbeque in Raleigh. Great stuff that should be a staple in downtown Raleigh. I think that the first component will be one of the shorter towers, near City Market. I would assume that is where Cooper’s BBQ will relocate. This place is definitely a gem and I can’t wait to see them in new facilities. Hopefully, they will replicate [successfully] most of the atmosphere. I was wondering though if it would be possible to get Cooper’s BBQ to relocate on Fayetteville Str. There are a couple of possibilities, I think. @Ernest: I think that they will start with the two shorter towers and then build the rest later. Maybe I’ll actually go there when they move into new facilities (LOL). It would definitely be nice to see them relocate onto Fayetteville Street. ‘Cause there’s certainly available space ( :( / :) ). What I’m really interested in is whether or not the Edison’s developers will build the entire shared nine-story base with the first one/two towers, or if they will wait until the 40 story towers are ready for construction? Ari, the plan is to build one tower at a time, and my guess is they will begin with the SE corner. Potentially, this is where Cooper’s BBQ will go – the developer wanted to keep this business in the same block where it became famous, I guess. I wish I had more details, but unfortunately :( It is more like wait and see. Also, it is safe to assume that the developer needs to get even more sales finalized of his West At North project, as cash is hard to come by these days, especially when you ask the banks to loan you money. Oh, ok, thanks Ernest. I was just wondering since Emporis.com lists the start date for the smaller towers as 2012.